The project comprises three towers — a hotel and two commercial towers — built in the air space above the Dhow Wharf age in Dubai Creek between the Dubai Chamber of Commerce and Al Maktoum Bridge. 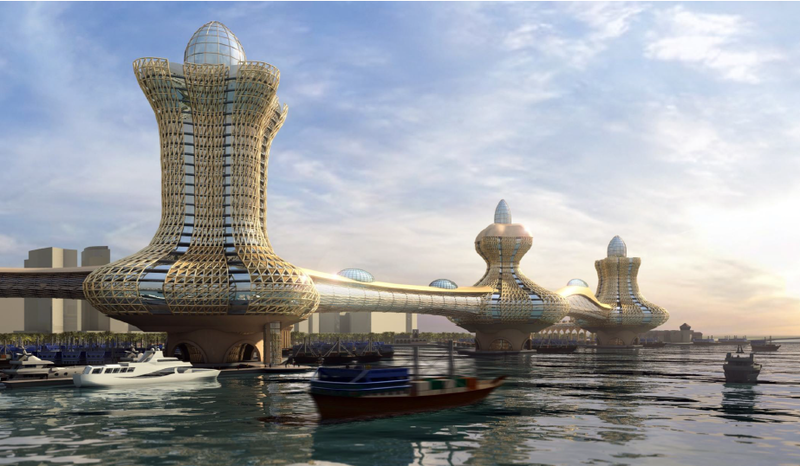 The towers of different heights, which look akin to the magical lamp of Aladdin, are connected with a 450m-long pedestrian bridge with travellator, leading to parking stations away from the project site. As per the conceptual design, the parking stations at the entrances on two sides of the project will have underground parking bays with their roofs designed as public parks. Announcing the project, Director-General of the Dubai Municipality Hussain Nasser Lootah said the towers are aimed to be icons of legends of the past with a touch of modern beauty and tourism characteristics of the city. The development of such a project in this area will have a global cultural and historical impact and pride for generations to come and will contribute to the progress of the emirate and its dream to be No1 in everything in accordance with the vision of His Highness Shaikh Mohammed bin Rashid Al Maktoum, Vice-President and Prime Minister of the UAE and Ruler of Dubai. In addition, it is expected to boost Dubai economically in its long-term goals by increasing tourism in the emirate, especially to Dubai when we are going to host Expo 2020. As per the design, the three towers will be constructed above the tip of each wharf of the port at a total area of 120,000 sq.m. The highest tower with 34 floors will house a hotel. The tower in the middle and the third tower with 25 and 26 floors respectively will be occupied by offices and commercial establishments. A total of 900 parking spaces will be provided in two parking blocks at the entrance points. Though the entry of visitors will be through the parking stations and the air-conditioned pedestrian bridges with travellators, the towers will have separate service lifts and emergency stairways that will be built in the middle of the roundabouts on the tip of the wharfs, according to Roxy Binno, who designed the project. The idea behind the project is to have a unique identity that is closely linked to the ancient legends and culture of the seafarers. The wharf age is where the sailors, who travelled to Africa, India and China for centuries, used to meet and share stories of Aladdin, Sinbad and kings who made buildings of odd shapes with domes. That is why the project was designed to depict such fables that are very much linked to the location’s past. The main challenge of designing the project was to avoid visitors passing through the crowded wharfs even as allowing them to enjoy the view of the wharf age, the Creek and the skyline of both the modern and old areas of Dubai. The pedestrian bridge allows a welcoming walk overlooking the traditional port and the unique and historic shipping activities, while the towers will offer sweeping panoramic views over the Creek toward old and new Dubai areas from Sheikh Zayed Road to the other end of the sea in Deira.